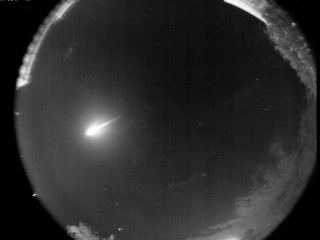 Composite all-sky camera image of the end of the fireball as seen from Hamilton (Camera #3, McMaster). Available below are movies of the event as seen by several of the SOMN cameras, as well as animations of the object's arrival at Earth. A streaking meteor that that recently appeared 100 timesbrighter than a full moon was caught on video camera, scientists announced lastweek. As thefireball plunged into Earth's atmosphere on the evening of Sept. 25, it wasdetected by cameras at the University of Western Ontario in Canada. Footageshows that the meteor, roughly the size of a tricycle, was moving at a speed of13 miles per second (75,317 kph) as it traveled over southern Ontario.? An analysis of data gathered from the system?s records,meteor radar, and infrasound equipment suggest the meteor was large enough tohave left behind fragments near the Niagara Peninsula. The debris may weigh asmuch as several kilograms. Researchers are interested in hearing from anyone who mayhave witnessed, recorded this event or found any of the meteoritefragments. ?This particular meteorite fall, if any are found, is veryimportant because its arrival was so well recorded," said Phil McCausland,a postdoctoral fellow at the University of Western Ontario?s Centre forPlanetary Science & Exploration. "We have good camera records as wellas radar and infrasound detections of the event, so that it will be possible todetermine its orbit prior to collision with the Earth and to determine theenergy of the fireball event. We can also figure out where it came from and howit got here, which is rare. In all of history, only about a dozen meteoritefalls have that kind of record. ?